The 2018 Volvo S60 saloon is set to be officially unveiled today, 20 June – and a sporty Polestar Engineered version will be a part of the all-new petrol and hybrid engine range. The new model will be revealed in full on Wednesday, but we already know a lot about Volvo’s mid-size saloon. For one thing, no diesel-engined S60 will be offered. The brand has turned its back on the fuel for good, stating that , and the decision not to offer diesel in its new S60 represents a significant step towards that goal. The move followed a slump in demand for diesel cars in the wake of exhaust emissions scandals. The diesel doldrums have doubtless been exacerbated by harsher tax levies, for both initial road tax and Benefit-in-Kind (BiK) tax for company-car users – many of whom might have the S60 on their shopping list. Porsche dropped diesel engines from its Macan SUV earlier this year, but hasn’t turned its back on the fuel for good. The new Volvo S60 will initially be offered with four-cylinder petrol engines that use the brand’s latest Drive-E technology to increase fuel efficiency. Plug-in hybrid versions will also be offered, using technology proven in models like the Volvo S90 T8 TwinEngine SUV. Mild-hybrid electrified petrol versions will be offered in the year following S60’s launch. Although only the front grille, headlamp design and a bird’s-eye view have been revealed so far, it’s already clear that the new S60 saloon shares its style with the latest Volvo V60 estate and is likely to have a strong resemblance to the larger S90 saloon. 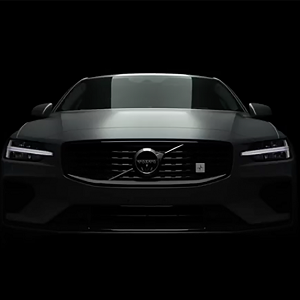 The new model is to be produced in South Carolina in the US – set to be the sole location for S60 manufacturing. The S60 is scheduled to reach European markets in early 2019 and is expected to be priced just below its V60 estate sister model, so a starting figure of around £30,000 is likely.